Join the discussion on our forums! 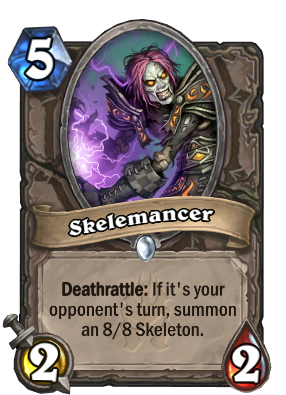 Come discuss Skelemancer over in our dedicated Skelemancer discussion topic. Sleeper OP card of Frozen Throne expansion. So...a while back I said this card was trash. Then people told me I was wrong, and I yielded and said they were probably right. Looking at it now, I haven't ever seen this card used, or used it myself to success. Even if there's "a lot of potential in it", potential doesn't make a card good. I'm going to go back and say this card is garbage. This card is way too good for paladins. Add spikeridge and its gg, its very powerfull unless you can silence of polymorph but they have so many other threats if you do that. Its tough playing mage this time around. kripp was right. this card is good. its also an unique anti aoe card. This is my favorite card of the expansion. Super defense against AOEs, the opponente has to invest or silence it.In combo with buffs it is crazy! And the best thing about it: You can play it, and buff it next round, because nobody is going to kill it!!! Same. Sleeper card of the set for sure. Especially good against the Warlock deck with Defile and aoe. I pulled three of these things golden when the expansion came out. So...at least it's 150 dust? Well...I never actually thought of using it that way. Well aren't I a moron? Isn't this just straight up awesome in Paladin with Spikeridged Steed? Fits perfectly to curve also. Except you won't actually get an 8/8, because Baron deals damage on your turn. For what it's worth, this card is just silly with Spikeridged Steed. In arena, this is simply a win-win turn 5 play. 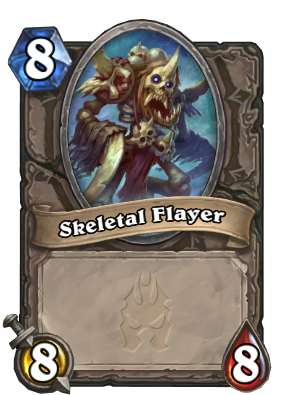 If they don't kill it, you get a 4/8 taunt that gives you a 2/6 taunt and an 8/8 when it dies. It's so beautiful how it works too since that 8/8 is protected by the taunt. Card isn't meant for constructed. It's just here so Kripp makes more salty videos.